People experience different emotions when faced with change. Change can be viewed as a grieving process of sorts. Elisabeth Kubler-Ross described five stages of grief in her seminal work, ‘On Death and Dying’ in 1969. 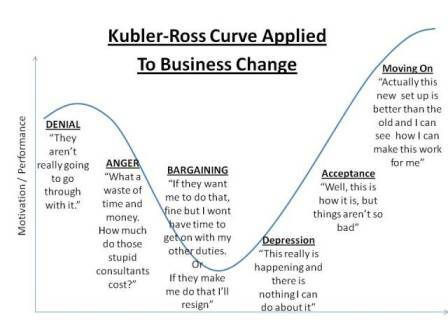 Kubler-Ross described the experiences of terminally ill patients and the psychological stages they go through when coming to terms with their condition. Her work on grieving process can be adapted to help us understand that individuals go through these same stages when faced with any big change, including changes at work. Different people move through the stages at different speeds, and there may be some overlap between the stages. It is important for leaders to recognize this individual process. A person’s history, the organization’s history, the type of change and the consequence of change also impact an individual’s response to change and movement through the stages. How Can Leaders Help Throughout The Stages? Start communicating that there is a change early on. This minimizes the ‘Shock/Denial’ phase, as people will have begun to see that there is a need for change, even if they are unaware of the form that it will take. When the change initiative is announced, give reasons that reduce complacency and highlight a need for change. Communicate in a way that is clear and touches people emotionally, not just with loads of data. Fully communicate the end vision of the change and what your intentions are. Don’t try too hard to sell people on the idea that things are better for them; they are not ready to hear this. Practice patience and empathy, and don’t try to suppress conflict. Provide a verbal outlet for people to vent their upset feelings. When leaders provide opportunities for grievances and frustrations to be aired constructively, bitterness and frustration can be diminished. Although people will be angry that doesn’t mean that what they say has no value, they may have legitimate concerns that could affect the success of the change initiative. Remember that most likely, people are not attacking you personally. Remain calm and patient. Often leaders have been made aware of a change initiative long before their teams, so although they may be at later stages (eg, be at “Acceptance/Moving on” while general staff are still at “Shock/Denial”). Exercise patience. When people start trying to bargain, ask them to give the new dispensation a chance. A lot of bargaining is done while people are still angry. Once the anger dissipates, so does much of the bargaining. Help people acknowledge that it is the end of an era, support them in their new roles and encourage them to take responsibility. Set goals with them of which they can take ownership. Continue your role as a sounding board for complaints and questions. Ask ‘How do you feel about this?’ to understand individuals’ emotional state. Begin to stress the benefits of the new situation and how it can work for the individual. If new teams were formed, provide help with group dynamics. People are generally less concerned with the tasks they are given than how they fit into a new group. Plan for some early successes for the change initiative and then communicate them loudly. Once people can see that it is working then they will be less skeptical and more positive about the change. Make sure the necessary resources are available for them to succeed, be it equipment or training or just coaching and guidance. Empower individuals to take the ball and run with it. Let them find ways of using the new set up to create stretch goals and encourage them to push performance. Let employees innovate and take risks within the new set-up. Let them not only see ways of making the new system work in their favor but put those into practice. For the individuals who really are taking the ball and running with it, reward them and promote them. Use them to show others what is possible. Having a fellow colleague really driving performance forward using the changes is worth far more than managers telling people things are/will be better. Once people can see it working for a colleague they will be far more receptive to the change. What “stage” of change are you leading through right now? Add your comments here.